The report coming from National Bureau of Statistics (NBS) is not a good news for Central Bank of Nigeria (CBN) because the inflation rate was reported at 12.4 percent. The recent numbers from NBS have shown that inflationary trends are not cooling down but rather are surging. The composite Consumer Price Index (CPI) stood at 12.4 percent; CPI is used to measure inflation level in the country. This is disappointing phenomena because it does not bold well neither it is conducive for economic growth. While inflation rate of month of April was 11.3 percent, the increasing rate of April has shown that CBN may be losing the battle at arresting the inflationary enemy as they promised. The tightening of the monetary policy maybe losing its grove, and it is beginning to look that it is beyond the power of CBN's application of monetary policy that comes with tinkling of the interest rate to reduce inflation. The usage of interest rate tinkling to control inflation may has limited effect and maybe waning. Nigerian economy has structural problem that must be corrected to be able to control inflation. The importation of essential commodities with its rising prices and the rising prices of food, petroleum and accommodations are causing the rising inflation. Obinna Chima, financial Reporter at Thisday wrote, "Worried by rising inflationary pressure in the country, the Monetary Policy Committee (MPC), which is chaired by the CBN Governor, Mallam Sanusi Lamido Sanusi, had surprisingly raised the Monetary Policy Rate (MPR) from 7.5 per cent, to 8 per cent at its last meeting. The Committee which also lifted the Cash Reserve Requirement (CRR) had expressed its desire to battle inflation which has stubbornly remained at double digits, to single digit rate. Most analysts attributed the hike in inflation to the rise in price of some household items, building materials and rents. They specifically pointed out that the high cost in kerosene and diesel contributed to the significant rise recorded in the CPI." National Bureau of Statistics (NBS), "The urban ‘All Items’ monthly index rose by 0.2 percent while the corresponding rural index rose by 1.5 percent when compared with the preceding month. The year-on-year average consumer price level as at May 2011 for Urban and Rural dwellers rose by 11.5 and 13 percent respectively. "The percentage change in the average composite CPI for the twelve-month period ending May 2011 over the average of the CPI for the previous twelve-month period was 12.6 per cent. This was slightly lower than the figure for the preceding month. The average monthly food prices declined by 0.3 percent in May 2011 compared with April 2011 figure. The level of the Composite Food Index (CFI) was higher than the corresponding level a year ago by 12.2 percent." Nigerian government has been increasing spending while at same time having large trade deficits with some trading partners due to increased spending and importation. Another source of the rising inflation may come from the massive and continuous borrowings of the Federal Government of Nigeria. Nigeria has been borrowing heavily lately in order to finance the rebuilding and renovations of infrastructures. The myriad issues that contributed to the rising inflation including the massive amount of money injected into the circulation to ease credit crunch. The recapitalization of the failed banks and the buying of the toxic assets of the failed banks introduced equally a large sum into the monetary base. The scarcity of petroleum products especially kerosene with the long queuing lines in Lagos and rest of the country has brought about hoarding and subsequent higher price. The refining of oil outside Nigeria and importation of petrol at this era of the global rising prices of petroleum are major contributing factors to inflation. Things of these nature and others are triggering higher inflation rate and rising inflationary trends. The inflationary pressure is escalating and at 12.8 percent inflation rate recorded at the ending of first quarter of 2011 is not showing any sign of coming down. According to the data coming from the National Bureau of Statistics (NBS) the February inflation rate stood at 11.1 percent and since then has increased to 12.8 percent at the month of March. The Central Bank of Nigeria (CBN) maybe gradually losing its grip on the rising inflation with its primarily application of monetary policy and should sought the aid of the presidency to utilize trade and fiscal policies to solve the problem of the persistent double digit inflation. The difference between months of February and March Composite Consumer Price Index (CPI), a tool to measure inflation rate stood at 1.37 percent. That is not a good development. The deduction to be made is that the power of monetary policy that comes with the usage of interest rate to hold a grip on inflation is waning. A while ago the Central bank of Nigeria raised the monetary policy rate from the previously 6.5 percent to 7.5 percent but it did not necessarily have any effect on the surging inflationary trend. Instead of the interest rate to be de-escalating rather it is accelerating at 1.7 percent, giving the month of March a higher interest rate at a double digit of 12.8 percent. The Governor of Central Bank of Nigeria (CBN), Mallam Sanusi Lamido attributed the surging inflation to rising food prices and energy cost. There is no doubt that the chieftain of CBN understood quite well what the beef is all about. But the reasons he tendered for the rising inflation are secondary and insufficient. The fundamental problem that Nigeria has is its major reliance on importation for essential commodities needed in the country. These are the primary problems that are making the inflationary pressure to be going up. Nigeria imports food, textiles and refined petroleum from abroad. The domestic oil refineries are not producing at optimum levels and importation becomes necessary with the subsidy. petroleum products. Therefore as the prices of oil and food increases due to global demand and anxiety in the market that subsequently has effect on economy of Nigeria and put untold pressure on inflation. The lowering and control of inflation in Nigeria for sustainable growth must be strategically planned and implemented. Monetary policy with its Interest rate can be utilized as in tactical approach to limit the power of inflation at a short term but in long term more should be done. The idea is to maintain a sustainable inflation rate at a single digit for a long term economic growth and development. The executive of the government has an important role to play in shaping the economic destiny of the nation and not abandoning the battle to defeat and tame inflation to the bureaucrats at Nigerian apex bank. To all and sundry it is becoming self-evident that the tightening of monetary policy has a limited effect in long term prospects waned and as the fundamental problems that plagues the economy persisted. The Nigerian annual economic growth is cruising at a comfortable level of above 7 percent but the increasing inflationary pressure is about to do one or two to the economy. Inflation by discouraging of the investors and by severely weakening of the country's currency naira can slow down economic growth and probably reverse the net gain effect. This is not the time for government to fold their hands and become reluctant observer. But no one is asking the executive arm of the government to weaken the independence of the Central Bank by intervening in the affairs of the autonomous apex bank. The financial actors and the Economic gatekeepers in the government must be pro-active, strategic and pragmatic. The executive arm must be serious about cutting down on importation and fixing the oil refineries in the country to avoid refining of petroleum abroad. This is time to be serious and not time for empty postulations, for we all can agree on what must be done. The government should work with textile and cement importers to find ways to slow down importation while increasing the usage of local materials for production. Nigeria has abundant raw materials for manufacturing cement and textile. The importers should be given tax breaks and other incentives that will compel them to look into local production with the home grown raw materials. The rising price of food including corn and rice are contributing to the rising inflation. There is a global demand for some of Nigeria's staple food that is imported. Nigerian government should be in partnership with large scale domestic farmers without being overbearing to them. Investment in research and development in the agriculture becomes necessary in order to find the solution to the problems of food storage and preservation. Food preservation will be needed to boost higher food production and sustainability therefore cutting down on food importation. Monetary policy as tool to control rising inflation is waning therefore CBN must look beyond its monetary policy tool to cool off inflationary rising temperature. Emeka Chiakwelu is the principal Policy Strategist at Afripol. Africa Political and Economic Strategic Center (Afripol) is foremost a public policy center whose fundamental objective is to broaden the parameters of public policy debates in Africa. To advocate, promote and encourage free enterprise, democracy, sustainable green environment, human rights, conflict resolutions, transparency and probity in Africa. There is good news coming from Nigeria’s National Bureau of Statistics (NBS) on inflation. It was reported that the February rate of inflation has receded to an annual 11.1 percent. Although the targeted rate by the country’s apex bank, Central Bank of Nigeria (CBN) was 10percent. The key point is that the inflation rate is receding and may likely come down to the CBN’s 10 percent target. The problem that summons the greatest barrier to the control of inflationary trends might be the rising price of oil that has increased above $100 per barrel. On one hand it is good because it will swell and increase the country’s decreasing foreign reserve due to excessive withdrawal. But on another hand since Nigeria refined 70 percent of her domestic consumed gasoline outside the country together with the inherent subsides would make it difficult for CBN to be consistent and to have smooth operations. Bloomberg reported that "While　Nigeria　is　Africa’s biggest oil producer, it relies on fuel imports for more than 70 percent of its domestic needs because of a lack of refining capacity. The government subsidizes domestic fuel prices, boosting its spending as oil costs rise, increasing pressure on inflation. Crude oil reached $106.95 a barrel on March 7, a 29-month high." But for now the price of oil was recorded less than $100 per barrel due to the lower demand as a result of the natural disaster that took place in Japan. But the rise of oil demand is likely to increase with the price eventually as Japan will need more energy to replace the collapse of nuclear technology. Nigerian government has been increasing spending while at same time having a large trade deficits with some trading partners due to increased spending and importation. Another source of the rising inflation may come from the massive and continuous borrowings of the Federal Government of Nigeria. Nigeria has been borrowing heavily lately inorder to finance the rebuilding and renovations of infrastructures. Rising Inflationary trend is the most persistent threat to Nigeria’s growing economy. The Central Bank of Nigeria and its monetary policy committee voted to lift the benchmark interest rate of previously 6.25 percent to 6.50 percent last time they met. Before that at the end of fourth quarter of 2009 when the monetary committee gathered, they left the interest rate unaltered at 6.25 percent. The inflation rate then was exceeding 13 percent although its surging momentum has since receded, yet inflation rate is still above 10 percent in the first quarter of 2011. The governor of Central Bank of Nigeria (CBN) promised to hold back inflation below 10 percent last year but inflation rate is still moving upward in spite of the tighten of the monetary policy. Sometimes the CBN can be overly cautious with its application　of monetary instrument to stem down inflation. When the benchmark interest rate was retained last year, Afripol financial experts commented on the timidity of the monetary policy committee in not raising the interest rate in the face of rising and persistent inflation. Nigeria has injected a lot of money into the monetary base to recapitalize the banks that were bailed out from total collapse due to mismanagement. Nigeria recapitalized the banks with almost $4 billion and Nigeria’s Asset Management Corporation (AMCON) is buying back toxic debts from bad banks at the tune of $14 billion. The liquidity flowing into the economy due to quantitative easing has the tendency to overheat the economy, thereby triggering inflationary trend. At same time the quick economic growth that attracts investment can over stimulate the economy and keep the inflation surging. On the borrowings of large amount of money, Nigeria's debt-to-GDP ratio may be minimal but that will not be an inducement for excessive borrowing. All the borrowings are bringing in a lot of money into the circulation and that too can exert inflationary pressure on the economy. The borrowings Nigeria made last year was enormous but it is not cooling off in 2011. Reuters reported that "Sub-Saharan Africa's second biggest economy (Nigeria) plans to issue 66.5 billion naira in February, including 36.5 billion naira in three-year and 30 billion naira in five-year bonds. For March, the DMO said in its offer calendar it would issue 30 billion naira each in three-year and five-year paper." There is a success story with the policies of Central Bank of Nigeria (CBN) on restrictions of inflation so far. To continue with the good result and to further cut back the receding inflation in Nigeria’s economic landscape, the Central Bank of Nigeria (CBN) will likely to continue with the tightening of its monetary policy and probably persuading the executive branch to cut down in spending. Rising Inflationary trend is the most persistent threat to Nigeria’s growing economy. The Central Bank of Nigeria and its monetary policy committee voted to lift the benchmark interest rate of previously 6.25 percent to 6.50 percent. The last time the monetary committee gathered at the end of fourth quarter of 2009, they left the interest rate unaltered at 6.25 percent. The inflation rate then was exceeding 13 percent although its surging momentum has since receded, yet inflation rate is still above 10 percent in the first quarter of 2011. The governor of Central Bank of Nigeria (CBN) promised to hold back inflation below 10 percent last year but inflation rate is still moving upward in spite of the tighten of the monetary policy. Sometimes the CBN can be overly cautious with its application of monetary instrument to stem down inflation. When the benchmark interest rate was retained last year, Afripol financial experts commented on the timidity of the monetary policy committee in not raising the interest rate in the face of rising and persistent inflation. Then Afripol commented that, “The Monetary Policy Committee of CBN is cautious in not altering the interest rate for fear of spurring any changes in the economy. But their timidity is not justified because inflationary trend is rising and infusion of the funds is not going to slow it down. Therefore it is logical that Monetary Policy Rate (MPR) at 6.25 percent be increased not retained. Again Nigerian economy is expected to grow up to 10 percent in the preceding year and together with inflow of cheap money from both foreign and domestic investors may spur higher inflation.” Therefore it may be little late, but the lifting of the benchmark interest rate will still be contributing in stabilizing and revising the inflationary trend. But this is not the time to pass judgment on the process, for the key thing is to do the right thing for the economy and financial wellbeing of Nigeria. Mr. Vincent Ogboi, an economic and financial expert at Afripol stated, “Rising inflation does not booster well for a progressive economic growth. Governor Sanusi must focus on inflation as a laser beam, with monetary policy at his disposal to bring the inflation rate to a single digit. One thing is to lower the inflation but another is to make it sustainable for long term economic growth. The rising prices of agricultural products and hydrocarbon need an intervention of the executive and legislative arms of government in plotting a strategy to revolutionize agriculture and energy sectors of the economy. What’s the deal with the rising inflation? Without doubt, Nigeria’s economic fundamental is relatively healthy. The GDP is growing at an impressive rate. The growth annual rate of 2010 was about 7.8 percent with a striking 8.29 percent at fourth quarter of last year and the economy is expected to grow above 8 percent in 2011. Naira is relatively strong when compared to dollar, in spite of the continuous withdrawal from Nigeria‘s foreign reserve which act as a war chest against aggressive currency speculators. The minister of finance was forecasting a more liberal growth of 10 percent on the grounds that infrastructures and electricity will be upgraded and improved. The level of investments flowing into the economy and Nigerian stock exchange are quite impressive. The achieving of lower inflation cannot be left only to the reserve bank. All the branches of the government and economic sectors have roles to play. Government will deliberately encourage the consumption of local manufactured products. Agriculture must be improved not only in preservation and storage but availability to all the corners of the country is intrinsic. This is where the improvement of transportation and infrastructure comes in. The over creation and printing of naira must be decelerated no matter how tempting it might be. Governor of Central Bank Nigeria and its monetary policy committee have to be on top of the issue of rising inflation. The problem of inflation can retard economic growth and dwindling away gained economic progress. In case of Nigeria with a problem of high unemployment, inflation can make matters worse by discouraging research and development. The ramification is that employers will have no appetite to produce and hire in economy weaken by inflation. Central Bank of Nigeria (CBN) and its Monetary Policy Committee have decided to maintain the current benchmark interest rate at 6.25 percent. The retaining of the Monetary Policy Rate (MPR) at 6.25 percent was a surprise. Although there were no big changes in the economy and the economy was supposedly cruising at a steady pace at 7.9 percent for the full year growth. But that is not the complete picture, the large infusion of funds for rescued banks and reconstructions are likely to overheat the economy, subsequently triggering higher inflationary trends. The once vulnerable banking sector with failed banks is being corrected. Initially the failed five banks were rescued with infusion of almost $4 billion dollars and the managing directors were sacked. And now, AMCON a state owned and controlled entity was set up to buy back toxic debts from ten banks at the tune of $14.6 billion dollars. The steady and large inflow of funds will definitely ease the credit crunch but it will likely increase the inflation. Therefore it was anticipated that a bump up of the interest rate to at least 7 percent should counteract the anticipated inflationary trend and the control of cheap money. Inflation looms as more spending and investment increases the economic output. The Monetary Policy Committee of CBN is cautious in not altering the interest rate for fear of spurring any changes in the economy. But their timidity is not justified because inflationary trend is rising and infusion of the funds is not going to slow it down. Therefore it is logical that Monetary Policy Rate (MPR) at 6.25 percent be increased not retained. Again Nigerian economy is expected to grow up to 10 percent in the preceding year and together with inflow of cheap money from both foreign and domestic investors may spur higher inflation. The issue of the rising inflation is real; at the last quarter, inflationary rate was above 13 percent even with the promise made by Governor Sanusi Lamido Sanusi of Central Bank to keep inflation below 10 percent at the fourth quarter of 2009. The economy at fourth quarter of 2010 is expected to grow at 8.3 percent in December compares to 7.9 in September. The rapid and increasing growth is putting pressure on inflation. The application of the latent monetary policy appears to be the last resort of the apex bank and it should be boldly but vigilantly applied to stem down inflation. Central Bank of Nigeria (CBN) have infused the total sum of N600 billion naira ($3.96 billion) into the Nigerian banking sector to recapitalize the banks that have been plagued with liquidity crisis and credit crunch caused by excessive lending, profligacy and corruption. The recent audits of the Nigerian banks by the Central Bank of Nigeria (CBN) have exposed the inefficiency of the banking sector. When the new governor of Central Bank came in he found out that some major banks were poorly managed and that corruption has eaten deep into the fabric of Nigerian banking system. Therefore the boss of CBN Mr. Sanusi Lamido Sanusi committed himself into cleaning the financial mess. Mr. Sanusi Lamido Sanusi the newly appointed chieftain of CBN conducted initial audits of the some of the banks. "Those audits revealed that five banks holding 30% of Nigeria deposits – Afric Bank, Fin Bank, Intercontential Bank, Oceanic Bank and Union Bank were on the brink of collapse due to reckless lending." There was a lax in the system and it was revealed that many loans made to some of the banks’ customers were neither repaid nor serviced but were left dormant. The CBN bailed out the five banks with 400 billion naira. The managers of the banks were sacked and those customers including many important business tycoons and respectful bureaucrats were compelled to pay back those bad loans. The governor of Nigeria’s apex bank Mr. Sanusi Lamido Sanusi went further with comprehensive investigation and audits of the entire banking sector. The audit findings including: lax in regulation, credit strangulation and low holdings among many banks. Due to the plunge in the deposit holdings among many of these banks, there was credit crunch in the system. The business cannot raise adequate capital from the financial institutions due to paucity of liquidity in the system. Again the Central Bank of Nigeria on October 2 recapitalized another four banks at the amount of 200 billion naira - "Bank PHB, Equatorial Trust Bank, Spring Bank and Wema Bank -- also judged to be facing a grave liquidity risk." Replenishing the holdings of the banks was a great move by the CBN, for that will make credit available to the business community and consumers. But that will not be the panacea to the problems of the Nigerian banks, which compels a comprehensive and invasive restructure of the banking system. Sansui‘s Central Bank must re-evaluate the rules and regulations and come with more stringent regulations that will close all the loopholes in the system. The regulations must be enforced aggressively with verifiable checks and balances. The frequency of the audits must be increased together with random audits can become a deterrent mechanism to inhibit the weakness in the system. Re-capitalization and bail out of the banks with this large sum of money - N600 Billion naira -may loom inflation. At the moment in Nigeria the inflation is hovering around 10-10.4% and it’s expected to dip below 10% in the next quarter. Therefore the commercial banks must be instructed to be meticulous in their lending in order to avoid excessive money in the circulation that might trigger inflation. Subsequently undermining the value of naira and further depreciation of already weaken naira. When CBN prints and borrow money to recapitalize the banks that may lower the Nigerian credit worthiness. And it may unleash higher inflation and the devaluation of naira. When CBN finances its recapitalization by withdrawing excessively from the foreign reserve, it poses a threat to value of naira and credit standing of the country. The greatest threat and the major contributory factor in the undermining of a given economy and its currency is inflation. The monetary well being of a nation can go under and deteriorated drastically when inflation rears its ugly head and a once buoyant economy can become sicken with depressing currency, GDP and lower productivity. But in most cases Inflation could become a tool to erode the debt of a nation; a country with large domestic and foreign debts can utilize the inflationary trends to reduce the burden of its debts. In the 2006 negotiation for the payment and the final settlement of the Paris Club debt, Nigeria was granted the famous 18% write-off that reduced the debt. But the reduction that inflation could have offer was not wholly taken advantage by Nigerian negotiators. Inflation with regards to debt can be use to grind down a given debt. Nigeria do not have to be necessarily overjoyed and satiated with the 18% write off because net debt would have gone down to 45-50% by the application of inflation – debt ratio. The bad era of the double digit inflation would have be effectively utilized and applied to erode the country’s debt. Therefore we can extrapolate that Nigerian payment of the foreign debt in 2006 would have been way lower, the so-called 18% write off notwithstanding. Applying the model used by Joshua Aizenman and Nancy P. Marion, the Nigeria’s average inflation since the IMF’s structural Adjustment Program (SAP) to the time of the debt settlement was hovering between 15%-25% that will significantly and drastically reduced the total payments that Nigeria made to both Paris and London Clubs of Creditors. But it must be made perfectly clear that nothing good comes from inflation except the decimation of standard of living with surplus but devalue currency that do not worth the value of the paper it was printed on. This is not a new paradigm in economics where inflation is celebrated, but far from the truth, even with its debilitating effect it can reduce or wipe-off of a given debt. The people of Zimbabwe are testament to the disaster inflation can bring to a nation. The dire poor health of the economy caused by inflation makes lives unbearable. To buy a loaf of bread, one can carry cartoons of the worthless paper notes currency to do the purchase. Even some war historians argued that hyperinflation in the Weimar Republic were among the causative agents of the Second World War making it possible for some Germans to become vulnerable to the manipulations of the Third Reich. The payments and servicing of Nigerian foreign debts owned to both Paris and London Creditors did not happened for the first in 2006. Prior to the final settlements of debts to both international syndicates – Paris Club of Creditor and London Club of Creditors, Nigerian government in early 1990s have started to buy back Nigerian debts and Naira from foreign creditors. But finally the government of President Obsanjo took the initiative to payoff the debts owned to the creditors. 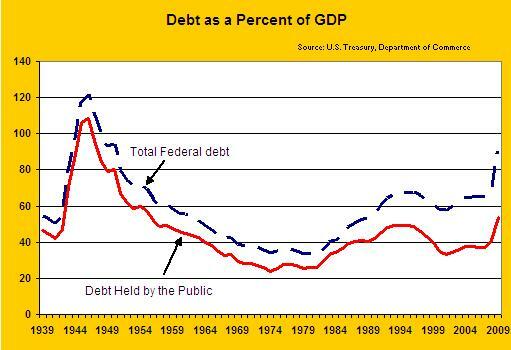 Of course it was a good thing to settle the debt for it did help to booster the economy and stimulate the economy due to availability of disposable resources. By this Nigeria will use her resources she accumulated by saving not borrowing to stimulate her economy. The only issue was the payment she made to Paris Club of Creditors was a large sum of money, without putting into account the dynamics of inflationary trends that kicked in after Nigeria borrowed the money from foreign institutions. 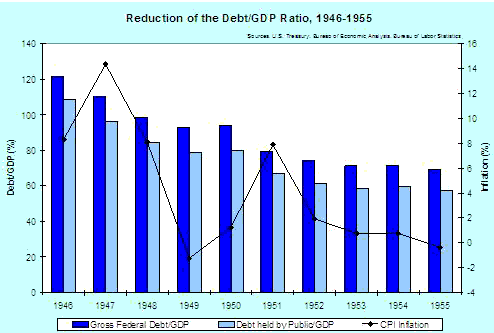 In the paper by Joshua Aizenman and Nancy P. Marion on “Using inflation to erode US public debt” - the two academic intellectuals illustrated with graphs shown below how inflation was used to erode US debts in both scenarios of the during Second World War of 1940s/50s and recession of 1970s. Nigerian government in the year 2006 paid almost $20 billion (including the human capital invested in the negotiation) to two giant international syndicates: Paris Club and London Club of Creditors to settle her foreign debts. The government of President Obasanjo, made the arrangement and secured the $18billion debt relief for Nigeria from the Paris Club of Creditors, and Nigeria pay off her $36 billion foreign debt. Nigeria's total foreign debt stood at $35.916billion as of June 2005. The largest chunk of the debt $31billion was owed to 15 of the 19 creditor-countries of the Paris Club. Nigeria paid off $12.4 billion in arrears and debts as was stipulated to fulfill arrangement and concord reached with the Paris club in June 2006. Nigeria paid the final installment of $4.518billion to exit the Paris Club. Federal government of Nigeria finally paid off the last batch of outstanding debts owed to the London Club amounting to $2.15 billion. For the settlement of both Paris Club and London Club of Creditors, Nigeria paid off almost $20 billion. This is one of the largest transfers of wealth by a third world nation to the first world nations. By this she acknowledged the severity of inflation in the country and its disablement with their policy. Therefore the negotiators for settlement of Nigeria’s foreign debt must have made their case or override making the case of justifying lower settlement because of inflation. But in some cases according to Professor Alan Auerbach of University of California, inflating away debt may not be possible because, “Sudden inflation can only inflate away the debt that is (1) not indexed, the way TIPS are; and (2) not very short term (i.e., not T-bills), so that the interest rates cannot be reset to much higher rates that would compensate for inflation.” Nigerian foreign debt was not indexed against inflation; maybe all the conditional ties appropriated to the debt were not unearthed by the citizens of the country. To further extrapolate the issue with regards to inflation, Nigeria final payment to both Paris and London Clubs would have been smaller had inflation-debt ratio been applied. Inflationary trends and inflation were devouring Nigerian economy in 1970s and 1980s and the era of oil boom notwithstanding. The Statistical bulletin of the Central of Nigeria was keeping statistics of the rate of inflation. In 1970s and 1980s inflationary trends were becoming explosive except in 1972 and 1973 inflation was modest hovering between 3% - 5%. (Central Bank of Nigeria Statistical bulletin). Naira was very strong in 1970s and early 1980s even with high inflation. Why this scenario? Because of financial and economic mismanagement, incoherent and uncoordinated monetary and fiscal policies. Together with overtly importation as Nigeria becomes the center of the dumping of foreign made commodities. It does look like that the party will last forever but then comes the oil bust and the crash of the oil price. Nigeria went on borrowing insanity to appease her spending appetite. Then it happened: IMF stepped in with its structural adjustment programs that encourages the devaluation of the naira. At this juncture inflation shoots up to 22%. Therefore, Nigerian negotiators would have exploited the inflationary paradigm tool for eroding debt; probably the final payment to the foreign creditors in 2006 would have been half or even one third of what was paid to the foreign syndicates.